Gone are the days when Hindi films were accused of not portraying children accurately - they were either unbearably saccharine or smart-alecky - both hyperbolic representations. A gang of school kids see themselves as the local dadas of their neighbourhood. Their biggest bugbear is that they always lose the cricket match while playing against the rival team. 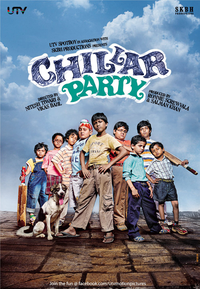 Finally 'Chillar Party' turns out to be an outing which despite featuring children isn't quite a 'kiddo flick'. To put it simply, just around 20%25% tweaking in the film's script could have easily allowed kids to be replaced by youngsters in their 20s and the impact would have still been the same. In that context, the script is flexible enough to cater to audience across all age groups, something which is its biggest strength. You should not miss this Chillar! Do watch it for its sheer brilliance. All in all, with some sweet moments that make you smile, heartfelt ones that have you tear up and whole lot of fun makes Chillar Party a lovely experience for kids and adults alike, regardless of its shortfalls. Do watch this, unless of course you hate kids. The lives of these kids gets difficult when Bhidu's life is endangered, thanks to a mean politician. The young ones fight the big bad world of politics and show that even they can move mountains.